Drivers who choose the 2019 Honda Fit will be ready for just about anything. We think that the new Honda Fit’s cargo space and seating make it a superior choice for our friends and neighbors in Mid-Michigan, and we’re not the only ones who love what it can do. According to the experts at The Car Connection, this year’s Honda Fit is “a no-frills, dependable compact hatchback” with “flexible seating, great gas mileage, a lively ride,” and so much more! Easy-to-use Magic Seats come standard across all trim levels, and once you’ve learned how they work, you’ll be able to handle an exceptionally wide range of bulky and unwieldy cargo. 5 95.7 cu. ft. 16.6 cu. ft. 52.7 cu. ft. The Honda Fit’s Magic Seats can make normallydifficult tasks feel like a walk in the park! In this compact hatchback, both the front seats and the 60/40 Split Second Row Bench have been designed with maximal flexibility. When they’re operated in concert, you’ll be able to situate your Fit’s interior into four unique configurations. Switching from the standard configuration to Utility Mode, Refresh Mode, Long Mode, or Tall Mode is as easy as one, two, three! Where LX, Sport, and EX models offer a cloth interior, the EX-L build comes standard with Leather-Trimmed Seats. Utility Mode: Utility mode will definitely feel familiar todrivers. In this configuration, both sections of the Fit’s 60/40 split rear bench seat are folded forward and laid flat, so you can take advantage of the maximum amount of available cargo space. Utility Mode leaves room for just one passenger but you’ll gain 52.7 cu. ft. of cargo storage space. Refresh Mode: Need to take a break after a long day on the road? Both the Driver’s and the Front Passenger’s Seats can recline almost 90 degrees, creating a surface that’s great for stretching your legs. It’s the perfect configuration for camping, tailgating, and so much more. Long Mode: The Fit’s Front Passenger Seat can fold forward in sync with its rear split bench seat, and when both portions are laid flat, you can take advantage of the entire length of the Fit’s interior. Tall Mode: The rear seat bottoms of the Honda Fit can be folded up and locked into place, giving you access to storage space that can accommodate cargo with a height of up to four feet. Delicate cargo that has to remain upright has never been easier to transport. Get More Done with Fit Accessories! Even the Fit’s baseline trim level comes full-to-bursting with useful standard features, but drivers who opt for a few accessories will be able to expand their capabilities. Every trim of this year’s Fit is available with a variety of accessories, and we’ve highlighted a few of the most exciting in the space below! 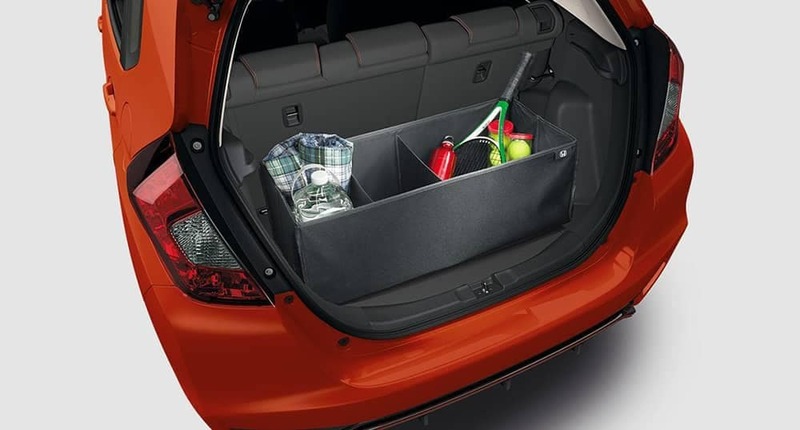 You’ll be proud of what you can accomplish when you put the 2019 Honda Fit’s seating and cargo capacity to work. You can get a hands-on feel for the Fit’s Magic Seat by taking onefor a test drive today! You’re sure to find the perfect Fit when you visit a Mid-Michigan Honda Dealer near you, and when you take advantage of our current offers and financing options, you’ll be able to bring it home for a price you’ll love.